Dr Peter Cattermole who has died this week, pictured receiving the Bridgwater Cup from Ken & Margo Richards. 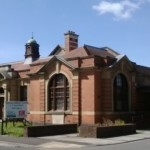 Leading light in the Bridgwater Heritage Group, Dr Peter Cattermole, passed away on 16th March Dr Cattermole had been involved with the Blake Museum, The Bridgwater Civic Society and was a regular contributor on planning issues .He also had connections with West Somerset Railway Museum. He was also significantly helpful to the Town Council across a whole range of aspects – not least IT matters and the Museum. He was Head of Science at the prestigious Winchester College before he retired to live in Friarn street in the Westover ward. Dr Cattermole pictured recently helping to preserve a 19th century Banner with Cllr Smedley & Dave Chapple, Chairman of the Civic Society. 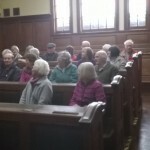 Can Bridgwater Magistrates Court be saved for Community Use?